What do you call a man who falls off his motorbike into a large puddle of mud? Supercross. 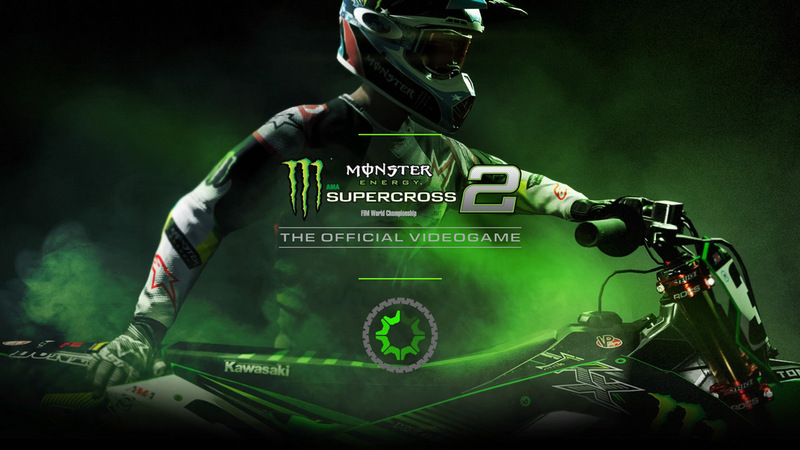 Here we have the second iteration of Monster Energy Supercross from Italian developer Milestone and – as you’d expect from a mainstream licensed game – it’s stuffed to the gills with bells and whistles. There’s not a huge difference in content from the 2018 version but the minor improvements are noticeable across the board, particularly with the excellent track editor. 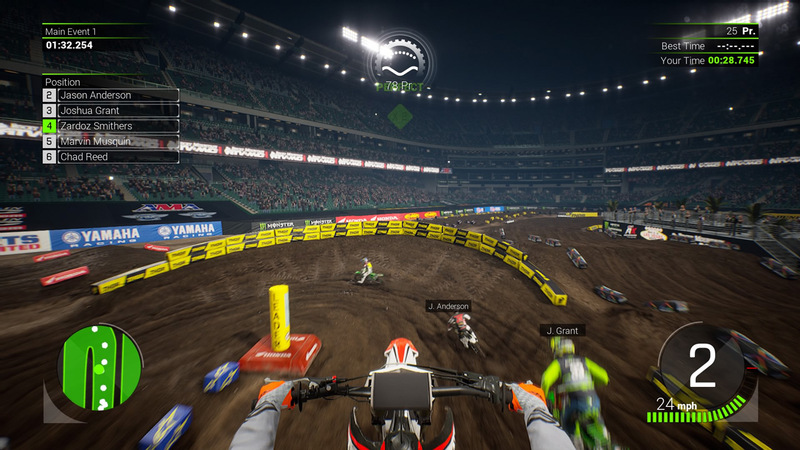 AMA Supercross is a big deal in North America and the huge arenas filled with fans accompanied by the usual stadium bombast is ample testament to this. Off-road races of 22 riders take place over a set number of laps with the competitors navigating variously undulating and twisting mud circuits across the U.S.A. The two leagues (250cc and 450cc) are represented here with a marked difference in handling styles along with contrasting engine sounds – a vicious rasp and a throaty purr respectively. There are plenty of the usual Single Player options on board to get your teeth stuck into. 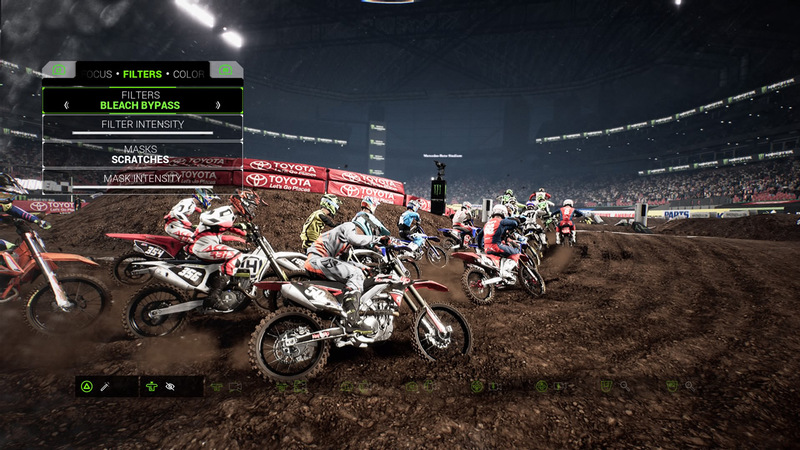 The Career offers up the full gamut of Supercross races interspersed with training, promotional opportunities and Challenges against your most bitter rivals in the championship. After devising your handsome/monstrous dead-eyed rider and choosing a manufacturer/sponsor, you then use your weekly planner to map out three days of activity prior to each race on the calendar. Training consists of five tutorials of three tiers enabling you to master different skills you’ll need during the racing season. Promotional days earn you money and consist of odd cut-scenes of your rider and bike in front of the sponsor’s branding. Likewise the Press/Fan meetings are much the same but behind a table with cash or fan points transferred to you after the junkets. A few fun Q&A sessions would have been a nice addition and perhaps a missed opportunity for developing your gormless looking character. 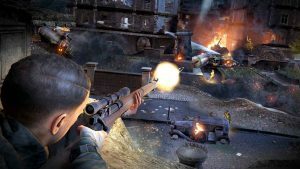 The Challenges allow you to take on one of your rivals in a short race or trial with the end result boosting your experience points. Once you’ve ticked these career boxes, it’s time to race. The full sense of occasion has been recreated here – bombastic tannoy announcements, excessive pyrotechnics, and a strange (but presumably authentic) scantily clad pre-race lady standing in the mud holding up a number 30. Germaine Greer would be spinning in her grave if she were dead. After this gubbins has thankfully been skipped, you’re off into the melee with the other twenty one riders, piling into the first corner at breakneck speed. Once the basic mechanics have been mastered, you can refine your riding style by using the right stick to lean into corners or perform simple stunts in the air. The option to control your rear brake separately is a nice addition for seasoned riders too. Points are awarded for stylish behaviour and perfect landings, all of which go towards levelling you up during the season. The sense of speed and weight is key part of any racing game and both boxes are admirably ticked here. Visually, the graphical prowess on display is impressive to say the least. 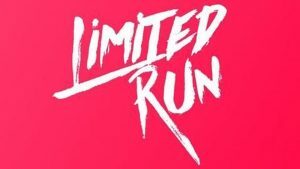 The game engine handles the full gamut of twenty two riders throwing up mud with aplomb and no hint of slowdown in evidence. Switching to the helmet-cam makes things a tad tricky but it’s supremely immersive, although those with motion sickness may need a paper bag handy. As the season progresses, you can use cash from your sponsors to upgrade your bike parts to boost performance. In tandem with this, your training sessions allow you to improve between each race giving a genuine sense of progression. It’s a shame that the same can’t be said of the licensed circuits and venues, which are all too similar in appearance and scope. There’s a bit of variety between indoor (dry) and open air stadiums (with added rain) but aesthetically there’s not much difference between any of them. 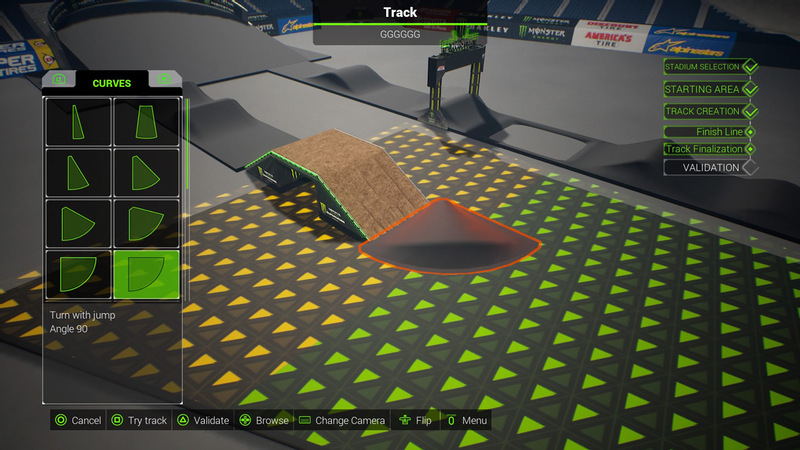 Each of the licensed circuits within the game has been constructed with the track editor so you can throw together any of the crazy jumps, u-bends, bridges or starting grid bottlenecks of your choice. However you soon realise that to make anything remotely playable within the confines of the stadiums, it has to follow the basic design of the licensed circuits: long straights with whoops (small bumps) or jumps, followed by tight turns to the next long straight. Without this formula, it can be a sluggish and fiddly rigmarole riding on your own tracks and more fun making them than playing them. 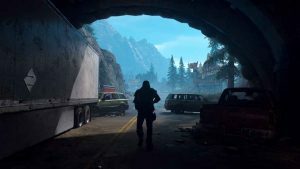 Had the track editor included some outlandish stunt sections to liven things up a bit and more space for high speed sections, then maybe it could have been more rewarding. It’s an impressive feature nonetheless. Unfortunately the elephant in the room is/are the abysmal loading times. During a normal career season I spent the same amount of time staring at a loading screen as I did actually racing. My weekly career planner had to feature ‘training’ sessions which I dreaded, knowing I would wait an age for it to load, only to play a 5 second training exercise. 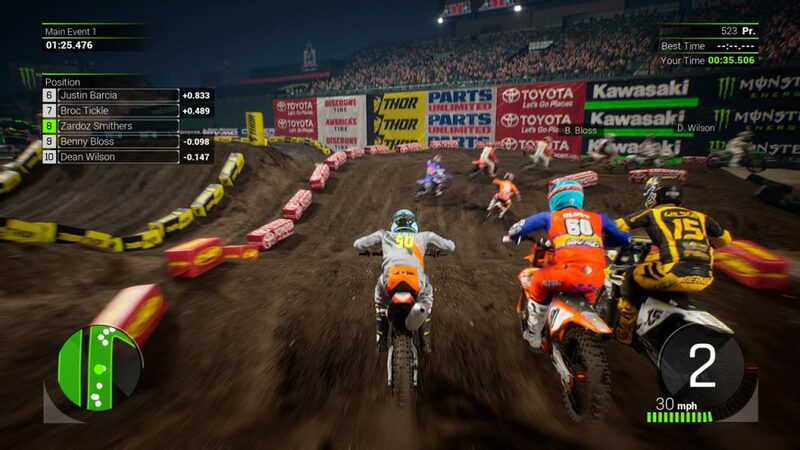 This had a significant impact on my enjoyment and it’s a major oversight from Milestone following criticism of the last Supercross game for the same reasons. 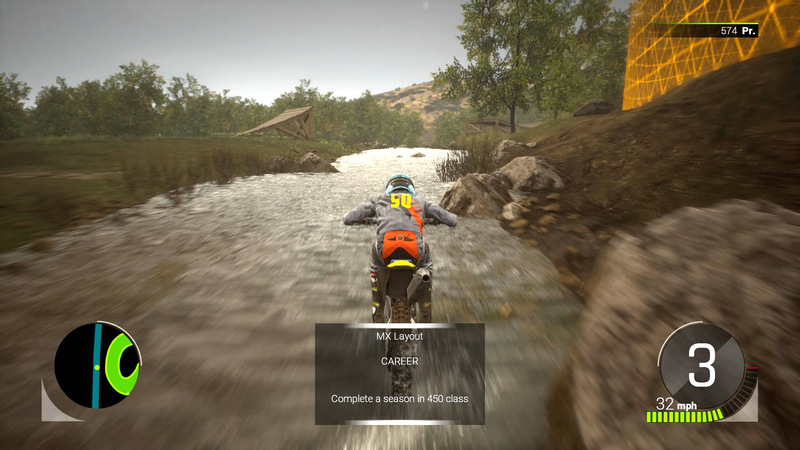 So all in all, Supercross 2 does some great things – an enjoyable one player career with plenty of depth and customisation options, up to 12 player online racing, an excellent track editor plus a superb graphical representation of Supercross in all its dirty glory. The replay and photo mode deserve a mention too – with 22 riders bunched up on the small circuits, there are some great photo opportunities. All this kudos is partly squandered by some very long and frequent loading delays, and an overabundance of pointless and samey pre-race cut scenes. Fans of the sport will love the authenticity and vast tweaking options onboard, while the rest of us can enjoy a decent two wheeled off-road racer which looks the part. It’s just a shame about the tedious loading times.